For Spring Break 2017, Wendy and I returned to Sugar Ridge Resort on Arkansas’ Beaver Lake for a few days of relaxation. We first stayed there in June 2014, and it has been our Spring Break destination for each subsequent year. This time our usual cabin, #6, was booked, so we stayed at the almost identical cabin #2. Wendy had fun feeding the birds on the balcony, attracting a number of cardinals. Back in April 2014 Wendy found a lovely small geode near Onyx Cave along the Sugar Camp Scenic Byway west of Eagle Rock, Missouri. (Not to be confused with the nearby commercial cave in Arkansas.) We decided to return there so she could scour the trail area for more pretty rocks. 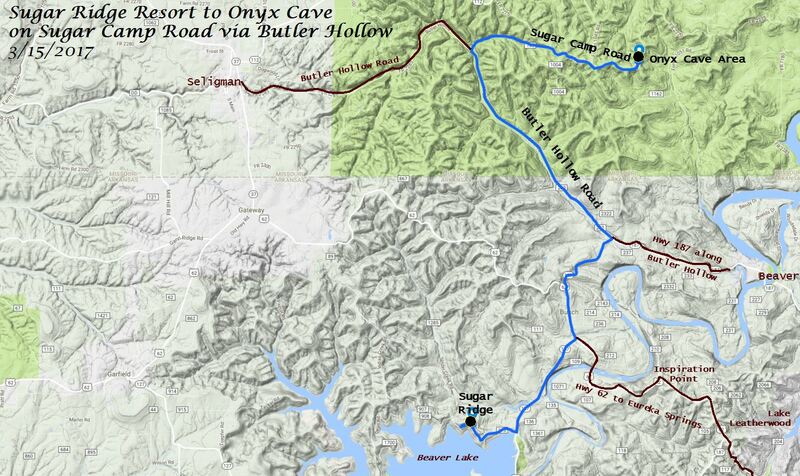 In planning the outing, I mapped out a scenic drive from Sugar Ridge to Onyx Cave via Butler Hollow. For the uninitiated, “hollow” is a term used in New England, Appalachia, and the Ozarks for narrow valleys formed by streams running through mountainous regions, à la The Legend of Sleepy Hollow. Ozark hillbillies call them hollers. The old Missouri and North Arkansas railway once followed Butler Hollow from Seligman, Missouri to Beaver, Arkansas. 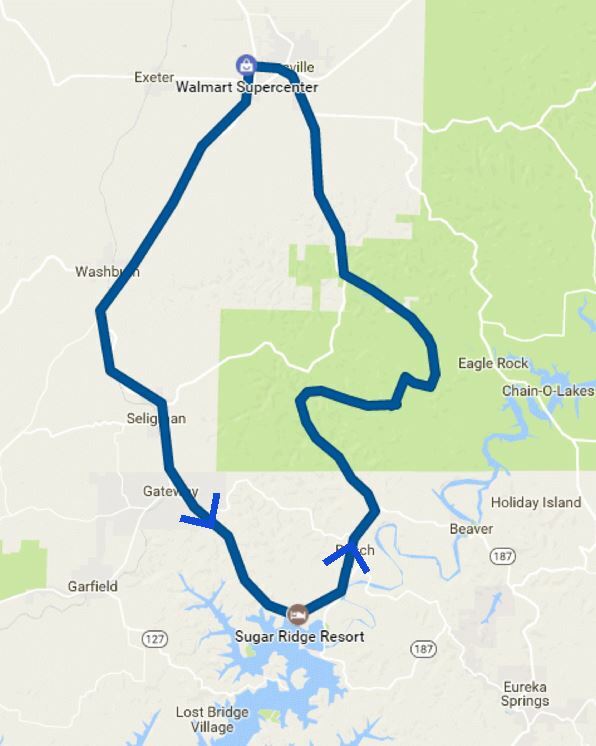 My great-grandmother Caldona Tennessee Burnett, who was called Dona, surely traveled this route, albeit not by train, since she was born near Beaver and married James Washington Weston in Seligman. My grandmother Effie was born in a log house her father built on Dona’s father’s place near Seligman. Wendy and I drove northeast on state highways from Sugar Ridge to Butler Hollow. But instead of turning right to follow Highway 187 southeast to Beaver, we turned northwest, taking the gravel Farm Road 2285 up the hollow into Missouri until we could turn back east on FR 2280 to reach FR 2270, which is the gravel section of the Sugar Camp Scenic Byway. We noticed some signs as we drove along Butler Hollow about “saving” the hollow. A later web search revealed that some residents opposed a forest service plan to restore glades in the area via logging, cedar tree removal, and rotating controlled burns. The forest service eventually adopted a plan that scaled down the project from 18,000 to about 3,600 acres; it is Alternative 4 in their online plan. 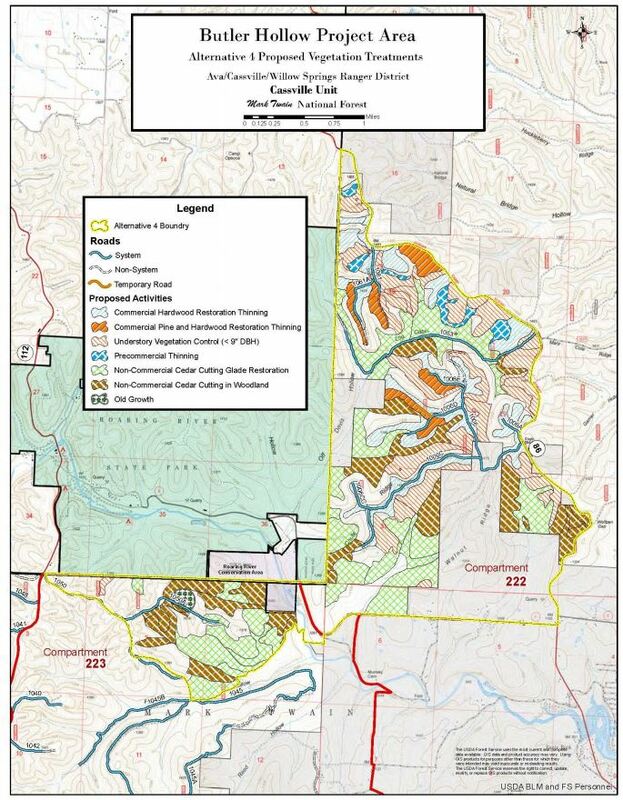 The plan will now address Chute Ridge directly east of Roaring River State Park over to Highway 86 along with Pine Hollow, which is just south of Roaring River State Park and north of the Sugar Camp Byway. A few years back there was a controlled burn of Chute Ridge to remove the debris left behind by a cedar tree removal project. I strongly dislike the invasive cedars I see spreading across Missouri, Arkansas, Oklahoma, and Texas. Fire suppression has allowed them to flourish. I’ve seen over the decades the results of a small glade restoration project in Roaring River State Park where the Firetower Trail intersects Highway F. That highlighted for me how the forest in southern Missouri is now quite different from what it was 150-200 years ago. Back then it had fewer but larger oak trees, a canopy that was fairly closed, and a much more open forest floor. Cedars were uncommon, and glades were larger and more frequent. My great-great-grandfather Nathaniel Meador arrived in Barry County, Missouri in 1849. That very year a survey of Butler Hollow in the southern part of the county showed no cedar trees and a large distance of 64 feet between trees. Before European settlement, fire swept the area on average every three years. 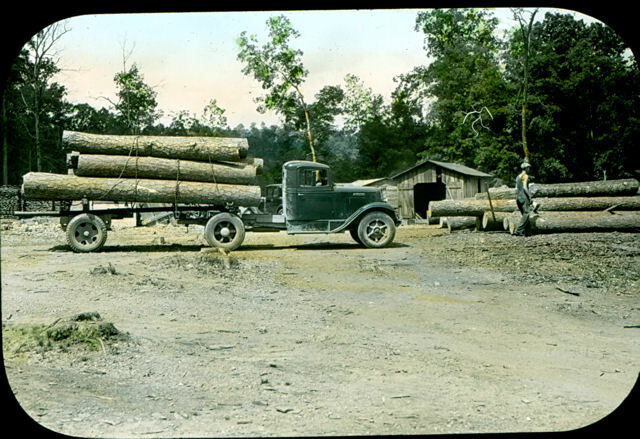 Most of the area was logged in the early 20th century, with much of the pine and white oak removed. Open-range grazing with frequent burning became the norm until the Forest Service acquired the lands in the 1930s and 1940s, ending most agriculture. The second-growth forest is now dominated by eastern redcedar, black oak, and red oak rather than white oak and post oak. The Forest Service would like to restore a fraction of the land to pre-settlement conditions, noting that the second-growth forest trees have reached maturity and are now in decline. Red oaks mature at around 60 years and by age 90 nearly all of them will show signs of decline. About half of the tree stands in the forest are now over 90 years old, and the other half almost entirely 50-90 years old. I understand residents’ worries about the glade restoration project, with its periodic controlled burns and the use of herbicides to prevent cut cedars from returning. The compromise of a smaller project adjacent to the state park seems reasonable. It will be interesting to observe its outcomes in the coming decades. Wendy and I navigated the gravel roads along and up from Butler Hollow without incident, reaching the Onyx Cave picnic area in the late afternoon. It overlooks Radium Hollow, so named because its Radium Spring produces water with detectable radioactivity from particles it picks up in the Chattanooga Shale it flows over. 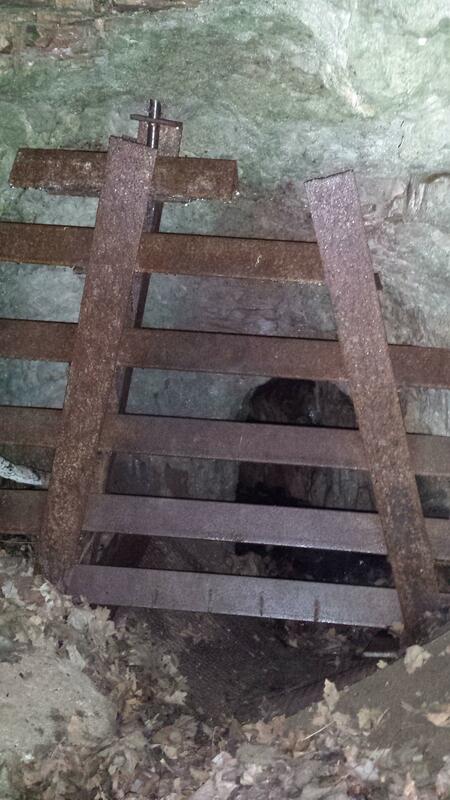 There is a very tall tale of the discovery of a radium cave in the area. Back in the 1920s Douglas Cloe is said to have bottled five-gallon jugs of the Radium Spring water for its supposed medicinal properties, and in 1950 a group reportedly surveyed the area with an eye toward uranium mining. None of that panned out, but below are photos I found online of the former radium mine and a concrete water tank nearby. Today the hollow to the east of the spring is the site of the Eagle Rock Retreat Christian camp. A trail leads down the west hillside from the Onyx picnic area on the Sugar Camp Byway to a blocked-off crawlway called Onyx Cave. It reportedly goes back into the hillside about 100 feet. Wendy and I hiked about half a mile at the site, searching the trail and surrounding hillside for pretty rocks. While she didn’t find any more geodes, Wendy the rockhound still had fun. I joined in the search but also slammed rocks together to break them open and observe their interiors, which were sometimes quite different in appearance from their exterior rind. We didn’t find much; Wendy would acquire many more rocks with crystals the following day when we returned to Lake Leatherwood, with her hunting rocks in a creekbed while I hiked an overlook trail. That will be the subject of the next blog post. Leaving Onyx Cave, we dropped north out of the forest via FR 2265 and 1162 to make our way across Roaring River and past Munsey Cemetery to reach Highway F. From there we made a dash through Roaring River State Park to Cassville for some supplies before returning to Sugar Ridge via state highways. The loop we ended up making vaguely resembled a north-pointing arrowhead. It was a fun outing, and someday we might return and venture down the side road off the Sugar Camp Scenic Byway (visible in satellite imagery but not shown in road maps) to Radium Spring. I love reading of the Meador family adventures! Tim and I love Sugar Ridge, but have t been there in a few years. It may be time for a return trip. It is always a good time to enjoy the Ozarks! Best to you both. I actually want to go prospecting there to get a sample of radioactive ore, live about two hours away from it. I am just really interested and will probably go with my new geiger counter soon.